The people have spoken: The MAROON's top Oscar picks by category. Sunday at 5:30 p.m. PST/7:30 p.m. CST, the 88th Academy Awards will be televised across the world, honoring the greatest filmmaking feats of 2015. To prepare for this event, The Maroon posted an online poll where readers voted on some of the most popular categories: Acting, Writing, Directing, Animated Feature Film, and, of course, Best Picture. We had a great turnout—over 200 voters in two weeks —and received some fascinating responses. Here’s a breakdown of the results in each category, along with my own two cents. The results in the biggest category of the night were the most exciting. 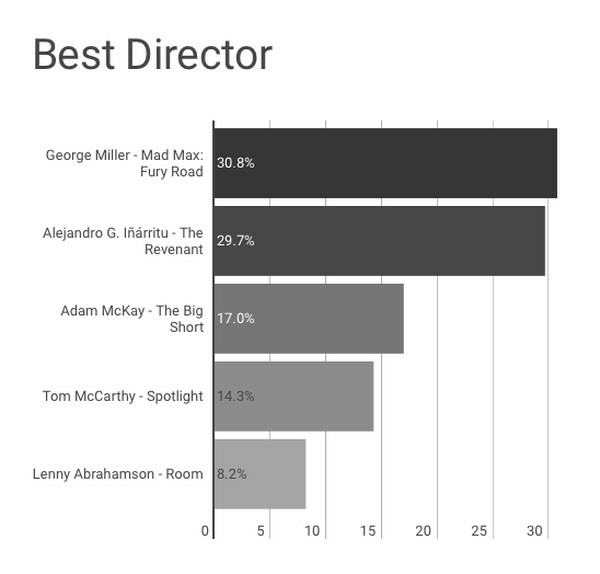 Every film on the ballot received considerable votes, with the majority of voters splitting them between, in ascending order, The Big Short, The Revenant, Spotlight, and Mad Max: Fury Road. 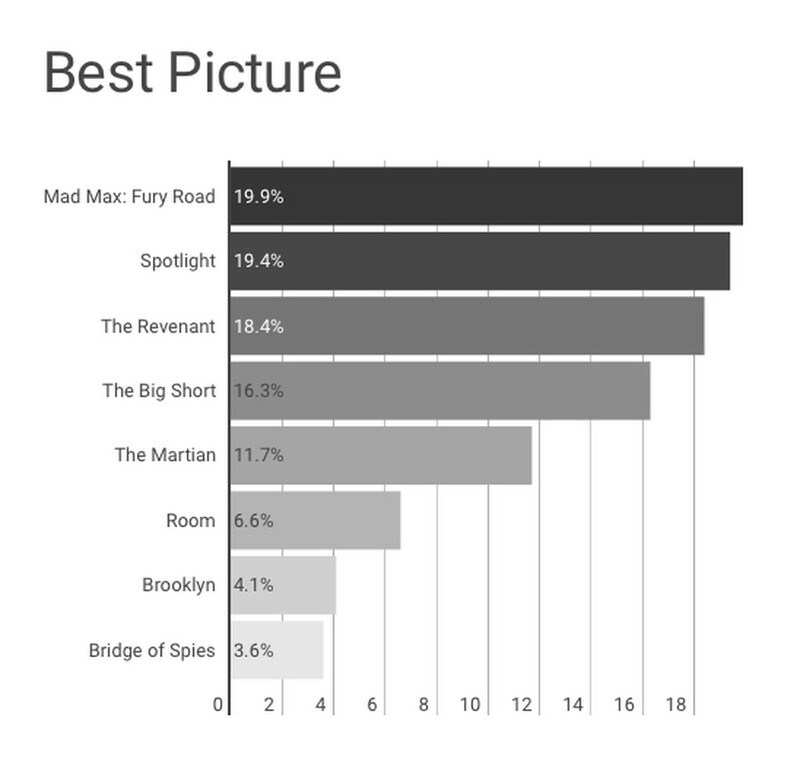 To put into perspective how close the runoff was: Spotlight only finished with a two-vote lead on The Revenant and Mad Max: Fury Road squeaked to the top by one vote. These votes are pretty reflective of current Oscars’ predictions, with analysts convinced that all of these four films have strong chances to go home with the trophy. My Vote: This category was the hardest for me to decide. I eventually narrowed it down to four (The Big Short, Mad Max: Fury Road, Room, and Spotlight) and went from there. The Big Short was the standout black comedy of the year, coupling a whip-smart screenplay from a best-selling novel with thrilling performances from A-list actors. Mad Max: Fury Road was an action film revelation soaring at the intersection of progressive ideology and high-adrenaline direction. Room communicated emotions that no other film in this category managed, crafted with aesthetic finesse and bolstered by phenomenal young leads. But Room ended up as my runner-up. I ultimately went with Spotlight. A film about the Boston Globe’s coverage of the sexual abuse scandal in the Catholic Church could not have been more impeccably executed, with every scene propelling the film to new heights of artistic mastery. Spotlight is the kind of film the Oscars were primarily made to recognize. This category became a head-to-head battle between the recently resurrected George Miller for his revolutionary approach to Mad Max: Fury Road and the reigning champion Alejandro G. Iñárritu for his maddening journey through a winter hell that is The Revenant. Miller took the gold with just above 30 percent of the votes. However, each nominee received plenty of attention in this category. My Vote: I have a lot of respect for Iñárritu’s deft craftsmanship and was also struck by Adam McKay’s smartly frantic methods in The Big Short. But my vote for directing has to go to Miller. He took a fascinating story, vamped it with a subversively hyper-masculine vision and the technical efforts to match, and directed his whole cast to a tee. Because of all this, Mad Max: Fury Road was undoubtedly one of the best-directed action films I have seen in some time. There was not much dispute in this category. More than half of you voted Leonardo DiCaprio for his thorough and dedicated performance in The Revenant (and trust me, the Academy will be on the same page Sunday night). There was also a lot of well-deserved love for Matt Damon in The Martian. 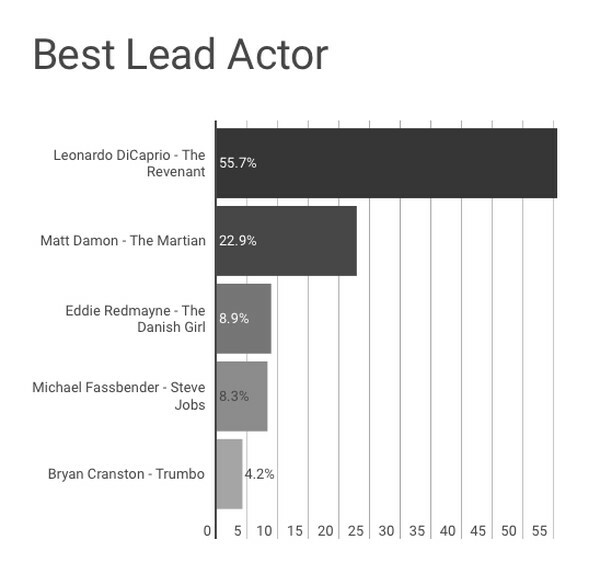 My Vote: I very much enjoyed Matt Damon as a wickedly resourceful stranded astronaut, and I was also particularly moved by Michael Fassbender’s take on the titular character of Steve Jobs. However, I have to give it up to DiCaprio. No actor on this entire ballot seemed like they gave as much effort as he did—definitely more than enough to earn my vote. Brie Larson’s heart wrenching all-or-nothing performance in Room has been turning heads all season, and it appears that at least a third of you felt the same way. 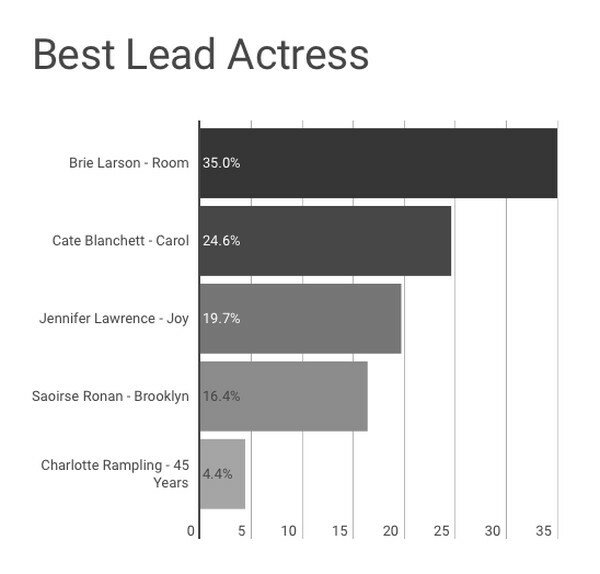 However, it wasn’t a landslide; Cate Blanchett’s powerful and mature performance in the less popular Carol also garnered a lot of your votes. My Vote: Without a doubt I have to give it to Brie Larson. She did a standout memorable job in a role that fit her like a glove, consistently illustrating the subtle transformations of her character from beginning to end. 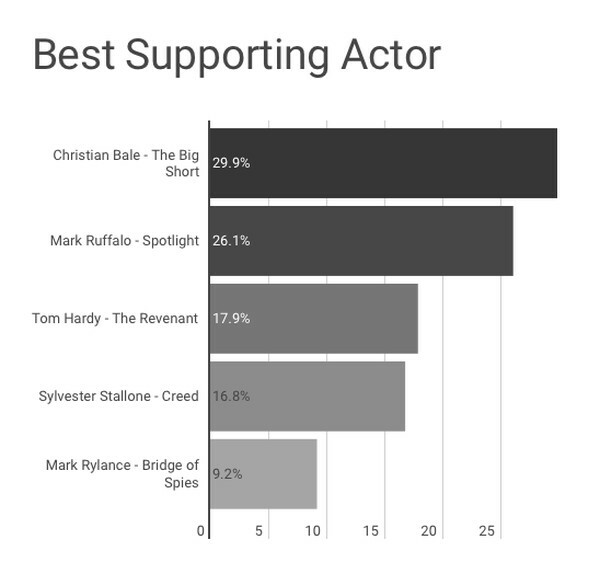 Most analysts have predicted Sylvester Stallone will take home an Oscar Sunday night, but you had different opinions: it was a close call between Mark Ruffalo in Spotlight and Christian Bale in The Big Short, with the latter getting the majority. My Vote: This category featured a lot of competitive quality performances—from Mark Rylance’s nuanced Soviet spy in Bridge of Spies to Tom Hardy’s abrasive frontiersman in The Revenant. But just like the voters, for me it was a toss-up between Mark Ruffalo and Christian Bale, with Bale winning me over just by a hair, his performance reflective of his impressive acting portfolio. This category was totally up in the air for voters, with every nominee receiving between 15–25 percent of total votes. The nominees represent a range of roles and personalities, some commandeering like Jennifer Jason Leigh in The Hateful Eight and some much quieter like Rooney Mara in Carol (although to be honest, I still cannot comprehend how Mara is competing in the Supporting Actress category, since she shared virtually an equal amount of screen time as love interest Cate Blanchett). 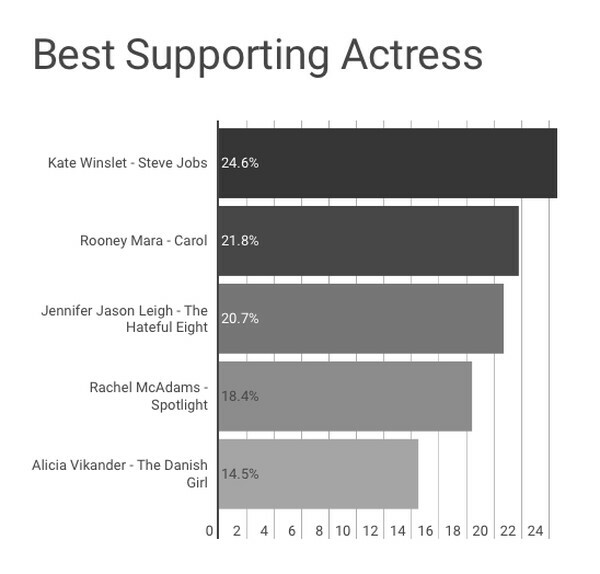 That aside, the voters eventually went with Kate Winslet in Steve Jobs. My Vote: It came down to two stellar performances: the mature, irresistibly collected Kate Winslet and the complex, soft-edged Rooney Mara. I eventually went with Mara because her feat of acting tapped into something even Blanchett’s character could not achieve: a calculated mix of insecurity and confidence, hesitation and steadfastness. Her reticence spoke volumes in this film—something only a talent like Mara could communicate. 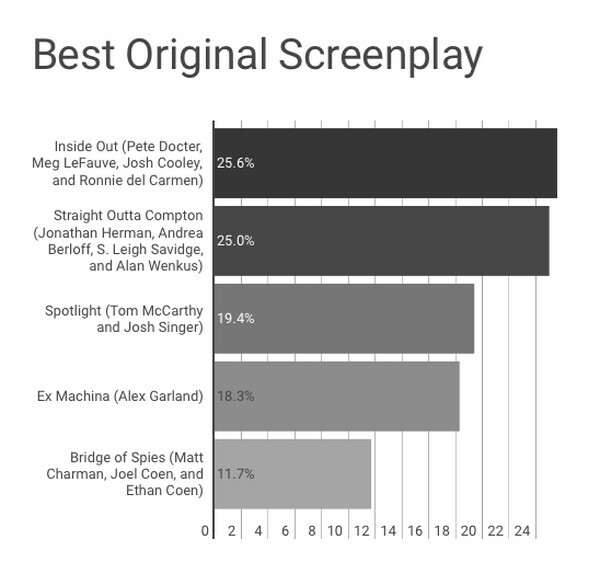 My Vote: Spotlight’s screenplay was airtight. And Ex Machina’s screenplay was both brilliant and chilling. However, in my humble opinion nothing surpassed the rawness and ambition of Straight Outta Compton. This screenplay was a sucker punch in the most pleasant and mature way possible and is more than worthy of capturing N.W.A.’s legacy.